Joe Freeman of The Oregonian labels five storylines to watch in the Trail Blazers-Thunder series, including how Portland’s new starting five operates. The Blazers appear poised to start Enes Kanter in place of the injured Jusuf Nurkic for the rest of the postseason, with Kanter tallying 20 points, 18 rebounds and two blocks in a Game 1 victory against the Thunder on Sunday. Cavaliers GM Koby Altman told reporters Friday that he has already been contacted by a team interested in trading for J.R. Smith, relays Joe Vardon of The Athletic. The interest isn’t so much in Smith as a player – he parted ways with the team in November and only appeared in 11 games this season – but in his contract, which is valued at $14.72MM but carries only a $3.87MM guarantee. A team looking to unload salary could deal for Smith and be on the hook for just $1.29MM annually if he is waived and stretched over three seasons. The Cavaliers showed a willingness this year to take on unwanted contracts in exchange for draft picks, trading for Brandon Knight, Marquese Chriss, Matthew Dellavedova and Nik Stauskas. Altman promised an “open-minded” approach to the team’s coaching search and brought up the possibility of making history by hiring a woman for the job. Though he couldn’t mention her by name because she’s under contract, Spurs assistant Becky Hammon is an obvious candidate if Altman wants a female coach. Hammon interviewed for the Bucks’ head-coaching job last year, ran the Spurs’ summer league team and has a player development background, which Vardon states is important to the Cavaliers. Other coaching possibilities that Cavs players mentioned to Vardon include the Nets’ Bret Brielmaier, the Mavericks’ Jamahl Mosley and the Trail Blazers’ Nate Tibbetts. All three have previous experience in Cleveland. Altman said interviews will begin soon with candidates whose teams aren’t in the playoffs. The Cavaliers believe their expiring contracts for next season might generate some interest on the trade market this summer. Knight and Dellavedova will both be free agents in 2020, along with John Henson, Jordan Clarkson and Tristan Thompson. Cleveland won a tiebreaker with the Suns for second place in the draft order heading into next month’s lottery. If they Cavs do wind up with the No. 2 pick, Vardon notes, their view of what type of player Collin Sexton will develop into may determine whether they opt for a point guard in Ja Morant or a wing player in R.J. Barrett. The NBA’s draft order is determined by the league’s reverse standings for that year, with the first four spots in the draft up for grabs via the lottery. However, when two teams finish the season with identical records, an additional step is necessary. Note: Grizzlies’ pick will go to Celtics if it falls outside top eight; Mavericks’ pick will go to the Hawks if it falls outside top five. Note: Kings’ pick belongs to Celtics (or Sixers if it’s No. 1). Note: Clippers’ pick belongs to Celtics. Note: Rockets’ pick belongs to Cavaliers. Teams’ lottery odds didn’t really change as a result of today’s tiebreakers. In instances where two or more lottery teams finish with identical records, the lottery combinations are split evenly among them, with the tiebreaker winner getting one extra combination if there’s an odd number. However, today’s results were still important. As a result of ending up at No. 8, for instance, the Grizzlies now have a 57.4% chance of retaining their own top-eight protected pick, something they don’t really want to do unless it jumps into the top four. The Celtics, who already have three first-round selections for 2019 and would prefer to roll that Memphis pick over to 2020, will get it if it falls outside of the top eight. There’s only a 42.6% chance that will happen. The Grizzlies’ result was the only good news today for the Celtics, who lost their other three tiebreakers. The pre-lottery 2019 draft order for the first round is listed below. For more information on the lottery odds for the top 14 teams, be sure to check out our recap from Thursday, as well as our glossary entry on the draft lottery. This year’s lottery will take place on Tuesday, May 14. Note: The Celtics will receive this pick if it falls out of the top eight (42.6% chance). Note: The Mavericks will keep this pick if it moves up into the top four (26.2% chance). Note: The Sixers will receive this pick if it moves up to No. 1 (1.0% chance). Information from Tankathon.com was used in the creation of this post. With the exception of bonuses that could still be earned – or missed – in the postseason, 2018/19 NBA team salaries are now frozen for luxury-tax purposes, ESPN’s Bobby Marks observes. That means that five teams will finish the ’18/19 season as taxpayers. While the Warriors‘ payroll is actually slightly higher than Oklahoma City’s, the Thunder met the repeater tax criteria, since they also paid the tax in 2015, 2016, and 2018. As a result, they’re subject to more punitive penalties, as we outline in our glossary entry on the luxury tax. The standard penalties for taxpaying teams start at $1.50 per dollar and increase from there; the repeater penalties start at $2.50 per dollar. Golden State will meet the repeater criteria next season if they’re in the tax again, since they’ll have paid the tax in 2016, 2018, and 2019. Teams qualify as repeat offenders when they’ve finished in the tax in three of the previous four seasons. The figures listed above are subject to change. For instance, Kyle Lowry has three separate $500K bonuses that he could still receive, depending on how far the Raptors advance in the playoffs. If he earns any of those, they’d be added to Toronto’s payroll and would in turn increase the club’s tax bill. Since half of the luxury tax penalty money is reallocated to the teams that finished out of the tax, those non-tax clubs are in line for payouts of approximately $3.1MM, per Marks. The Heat, Wizards, and Rockets made in-season transactions to get out of tax territory and will now receive $3.1MM from the tax pool. Other clubs, such as the Grizzlies, Knicks, Hornets, Cavaliers, Pistons, and Bucks, managed to keep their team salaries just below the $123.73MM tax threshold throughout the league year. Trail Blazers forward Maurice Harkless has a $500K bonus in his contract for shooting at least 35.0% on three-point attempts, but he won’t earn it this season, having made just 27.5% of his threes. As Marks details, the incentives had been considered likely this season, but it will be adjusted to unlikely for 2019/20. Portland will slightly reduce its tax bill for this season and Harkless’ cap hit for next year will dip from about $11.5MM to $11MM. The Trail Blazers may have injured guard C.J. McCollum back in their lineup tomorrow, tweets Jason Quick of The Athletic. McCollum is listed as probable for a second straight division showdown with the Nuggets. He hasn’t played since suffering a left knee strain on March 16. The return of McCollum, who is second on the team in scoring at 21.3 PPG, comes at an opportune time for Portland, which is trying to hold onto home court advantage in the first round of the playoffs. After last night’s loss to Denver, the Blazers stand at 50-29, just one game ahead of the fifth-place Jazz. The Timberwolves will decide the fate of GM Scott Layden after the season ends, with ESPN broadcaster Chauncey Billups and Nuggets assistant GM Calvin Booth among the top candidates if Minnesota decides to make a change, tweets Marc Stein of The New York Times. Wolves owner Glen Taylor was reportedly unhappy with Layden and former coach/executive Tom Thibodeau over the way they handled Jimmy Butler‘s trade request. Thibodeau was dismissed in early January. A $9.2MM non-taxpayer mid-level exception will provide the Timberwolves with their best chance to improve this summer, writes Danny Leroux of The Athletic. All five starters will be under contract if Jeff Teague opts in to his $19MM salary, so Minnesota can use the MLE to try to fortify its reserves. Leroux suggests Marcus Morris, Tyreke Evans, Jeremy Lamb, Reggie Bullock, Wayne Ellington and Terrence Ross as possible targets. When we recently identified a handful of Eastern Conference free-agents-to-be who have significantly increased their stock this season, that list was headlined by players like D’Angelo Russell, Nikola Vucevic, and Bojan Bogdanovic, all of whom should be in line for big-money deals this summer. It’s a little trickier to identify similar players in the West. That’s not to say there aren’t plenty of big-name free agents in the Western Conference. However, guys like Kevin Durant and Klay Thompson entered the year expecting to be in line for lucrative long-term deals and nothing they’ve done has changed that outlook one way or the other. Still, there are a number of lower-tier FAs-to-be in the West whose strong years have boosted their earning potential for the 2019 offseason. Today, we’ll shine a spotlight on a few of those guys, identifying five players in contract years who have improved their stock with their play this season. Kelly Oubre, F, Suns (RFA): With Otto Porter ahead of him on the depth chart in Washington, Oubre never really had a chance to thrive with the Wizards in the same way he did after being traded to the Suns. In 40 games with his new team, Oubre played a career-high 29.5 minutes per contest, averaging career bests in PPG (16.9), RPG (4.9), APG (1.6), SPG (1.4), and FG% (.453) as well. 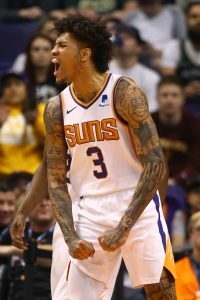 Despite a crowded depth chart at small forward in Phoenix, Oubre looks like a core long-term piece, and should receive a long-term contract this offseason. Patrick Beverley, G, Clippers: After he missed nearly all of the 2017/18 season due to microfracture and meniscus surgery on his knee, it wasn’t clear whether Beverley would be the same player upon his return. His play for the Clippers this season has put those concerns to rest. In addition to filling the stat sheet with 7.6 PPG, 5.0 RPG, 3.8 APG, and a .393 3PT%, the veteran point guard has continued to make life miserable for opposing perimeter players with his aggressive defense. The 30-year-old may not be in line for a massive payday, but he has proven he can still be an important contributor. Ivica Zubac, C, Clippers (RFA): Beverley’s teammate for the last two months, Zubac joined the Clippers in the most baffling deadline deal of 2019. The young center had been enjoying a breakout year for the Lakers, who gave him up for Mike Muscala. Zubac has been ever better for the Clippers than he was for the Lakers, averaging 8.9 PPG, 7.5 RPG, and 0.9 BPG in 19.7 MPG since his arrival. His impact on defense has been particularly noticeable — the Clips’ 103.9 defensive rating with Zubac on the court would rank first in the NBA, and is 6.2 points better than their rating when he sits. Seth Curry, G, Trail Blazers: Like Beverley, Curry missed the 2017/18 season due to an injury, raising questions about what sort of player we’d see when he returned. The Trail Blazers, who signed Curry to a one-year, $2.8MM contract last July, have to be thrilled with their investment, as the 28-year-old’s .448 3PT% ranks third in the NBA, just ahead of his brother’s mark. Players who can knock down outside shots at that rate tend to do pretty well on the open market these days. Danuel House, F, Rockets (RFA): With apologies to Derrick Rose, whose impressive comeback season was marred to some extent by ongoing health concerns, House claims the last spot on my shortlist due to his unexpected impact on the Rockets. Houston’s season got off to a rough start, and the absence of reliable three-and-D players like Trevor Ariza and Luc Mbah a Moute was a factor. House helped right the ship with his solid play on both ends of the court, as he shot 42.0% from downtown and forced the Rockets’ hand in a contract dispute — the team had to convert House’s two-way contract into a one-year NBA deal, putting him in line for restricted free agency in July. He’ll certainly draw more interest this time around than he did a year ago. Trail Blazers guard C.J. McCollum has been sidelined with a left popliteus strain since March 16, but has ramped up his on-court work as he nears a potential return, writes Casey Holdahl of Blazers.com. McCollum still wasn’t ready to commit to a specific return date, but sounded optimistic that he won’t be on the shelf for much longer. With four games left in the season, Portland has a two-game cushion on Utah for the No. 4 seed. The Blazers will finish their season against the Nuggets (twice), the Lakers, and the Kings as they look to secure home court advantage for the first round — it remains to be seen whether McCollum will be able to get back for any of those games. The Trail Blazers recorded their 50th win on Wednesday night, which means that injured center Jusuf Nurkic has officially earned a $1.25MM bonus. As Bobby Marks of ESPN.com details, Portland is now on the hook for another $2.19MM in tax costs, though that number will decrease a little when Maurice Harkless fails to shoot 35% on threes. Nurkic’s cap hit for 2019/20 will rise from $12MM to $13.25MM, since that 50-win bonus is now considered “likely” for next season. 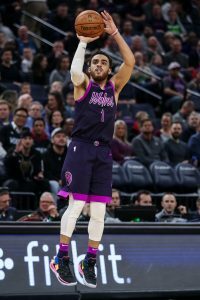 When the Timberwolves faced the Mavericks last night, Anthony Tolliver could have been playing against the Wolves rather than for them, notes Darren Wolfson of 5 Eyewitness News, who tweets that he thinks Minnesota should have accepted Dallas’ trade offer of J.J. Barea and a second-round pick. Wolfson has previously reported that the Thunder and Raptors offered second-round picks attached to Patrick Patterson and C.J. Miles, respectively, for Tolliver, but those deals would’ve taken the Wolves into the tax. In a discussion at The Athletic, Britt Robson and Jon Krawczynski look ahead to the Timberwolves’ offseason, examining the return from the Jimmy Butler trade, Ryan Saunders‘ future, and much more. Jusuf Nurkic‘s season came to an early end this week when he suffered a horrific leg injury that figures to sideline him for much of the 2019/20 campaign as well. While it was a devastating blow for Nurkic and the Trail Blazers, the veteran center might get a bit of good news before the regular season. As Bobby Marks of ESPN.com details in an Insider-only story, Nurkic will earn a $1.25MM bonus if Portland records at least 50 wins this season. The Trail Blazers’ record currently sits at 47-27, giving the team eight more games to win three more games, which seems like a reasonable bet. If Nurkic does earn that bonus, the Blazers’ projected tax bill will increase by more than $2MM and the big man’s cap hits in future seasons would rise, Marks notes.